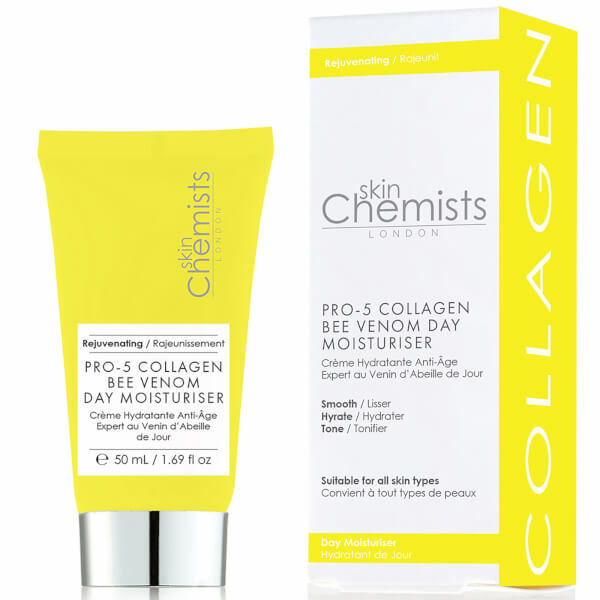 Target signs of ageing with the Pro-5 Collagen Bee Venom Day Moisturiser from skinChemists London. Infused with Manuka Honey and Hyaluronic Acid, the ultra-hydrating formula minimises the appearance of fine lines and wrinkles for a smoother, younger-looking complexion. 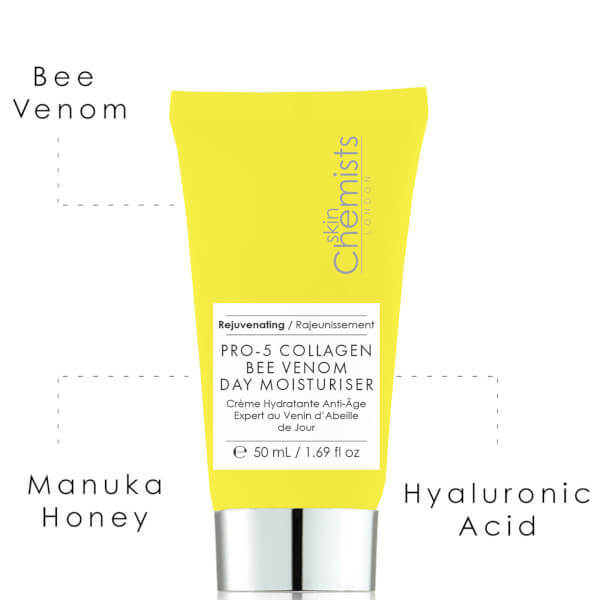 A dose of Bee Venom mimics the after effects of a bee sting to promote firmer, more plumped skin, whilst moisturising Coconut Oil strengthens the skin's barrier and defends against environmental aggressors. 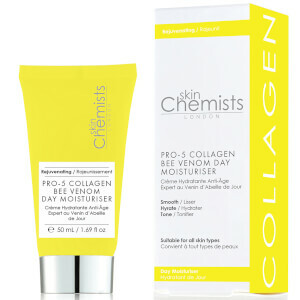 Expect renewed, refined skin with improved texture and tone. 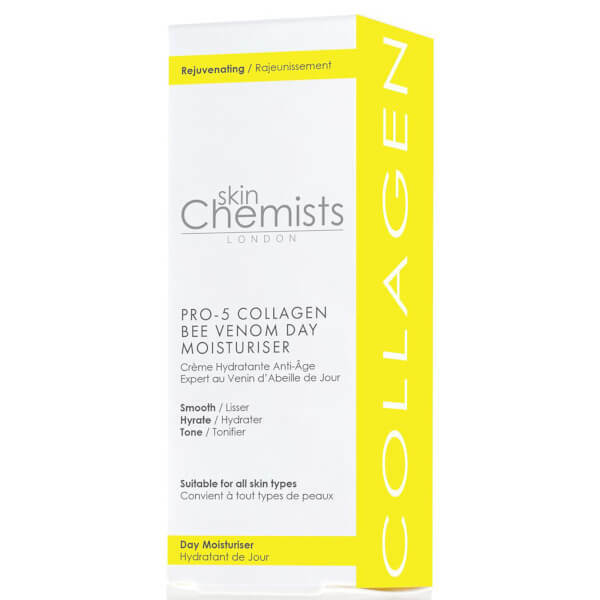 Aqua (Water), Glycerin, Glyceryl Stearate Cetearyl Alcohol, Xylitylglucoside, Stearic Acid, Cocos Nucifera (Coconut) Oil, Isoceteth-20, Phenoxyethanol, Anhydroxylitol, Benzyl Alcohol, Mel (Honey), Carbomer, Xylitol, Mica, Sodium Hyaluronate, Ethylhexylglycerin, Disodium EDTA, Dehydroacetic Acid, Parfum (Fragrance), Gardenia Tahitensis (Tiare Flower) Extract, Benzyl Salicylate, Hexyl Cinnamal, Limonene, Bee Venom, CI 77891 (Titanium Dioxide).